Summary: A vast network of foundations, non-profits, government entities, and political organizations have a vested interest in the continued growth of the resettlement of refugees in America. Because they receive billions of dollars in federal grant money, publicly-financed, tax-exempt organizations have significant incentives to support political candidates and parties that will keep these programs alive. These organizations need to be thoroughly audited and the current network of public/private immigrant advocacy and resettlement organizations needs to be completely overhauled. Resettling refugees should be a voluntary, genuinely charitable activity, removing all the perverse incentives government funding creates. 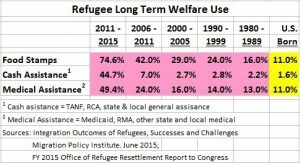 Refugee populations impose huge fiscal burdens on federal, state, and local governments beyond direct program costs. Costs include translation services, English as a second language classes in local schools, overburdened public housing, crime, and even terrorism. Amarillo’s experience points to the problem existent in many cities, where refugee contractors blithely ignore the problems they create by directing refugee populations into already overburdened communities. In New Hampshire, refugee bedbug infestations forced temporary closures at a library, a VA urgent care center, hotels, schools, and housing projects. The mayor of Manchester, which has taken in the most refugees in the state, repeatedly called for a pause in refugee resettlement. Dominic Sarno, the Democratic mayor of Springfield, Massachusetts, had the same request. Like every other politician who has complained about the problems refugees bring, regardless of political affiliation, he was vilified. 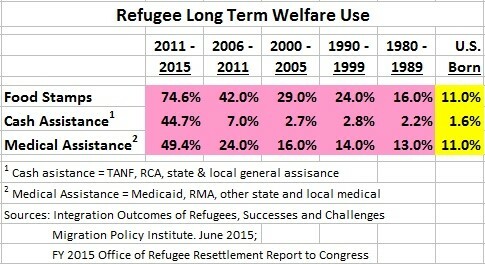 Refugees use welfare at very high rates for a long period of time. Table VI (below) details this use over the first five years for the 2009-2014 cohort as published by ORR’s annual report to Congress. 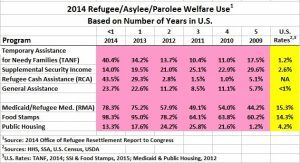 Beyond five years, welfare use trails off slowly, but even after 40 years, refugee groups use welfare at rates higher than U.S. born citizens and even other immigrants. FAIR estimated the total of these costs to be $15,900 per refugee for each of the first five years in the U.S. This included agency program costs which have already been largely documented. If the federal government program costs are removed, the per refugee net cost would be $7,632 after, including FAIR’s estimate of taxes paid by refugees. Over the most recent five-year period, an estimated 709,760 refugees have been resettled in the U.S, excluding unaccompanied alien children. The welfare cost for this group will be $5.4 billion over five years or $1.1 billion per year. Private foundations overwhelmingly support the refugee resettlement agenda. Much of that money is spent on advocacy groups like Welcoming America, but VOLAGs and affiliates receive substantial foundation funding in addition to taxpayer-funded government grants. The International Rescue Committee has received over $325 million from private foundations since 1999, including Open Society ($2.3 million), Novo Foundation, ($58.7 million), Buffett ($31.4 million), Vanguard ($23.4 million), Tides ($8.0 million), Newman’s Own ($6.5 million), Unbound Philanthropy ($2.2 million), even Google ($2.8 million), and many others. $100,000 of Open Society’s money was slated “to provide support for the executive transition” at IRC. There is no further explanation of this grant, but this was the year Socialist former British MP, David Miliband took the helm at the International Rescue Committee. Miliband made $671,749 as CEO that year. Exactly what other transition was required beyond his exorbitant salary? A similar story could be told for the rest of the VOLAGs and their 300 plus affiliates. The Trump administration has taken many steps to rein in the resettlement program. It has instituted what it calls “extreme vetting,” which, in practice, is the kind of vetting that was supposed to be in place all along but hasn’t been, at least in recent years. The administration can only go so far with vetting, however. Many refugees come from failed political systems or countries already unwilling to cooperate with the U.S. Using databases and even identifying documents to evaluate the credibility of refugee claims is therefore difficult, and in some cases impossible. There will always be a risk when the program seeks to resettle thousands of people en masse every year. The Trump administration also went to great lengths in its attempt to limit immigration from nations with terrorism concerns. 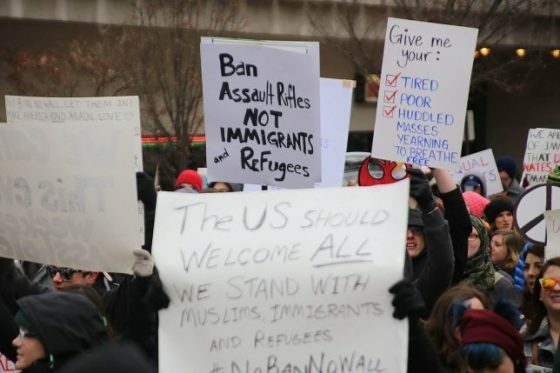 The various so-called travel bans were met with overwhelming opposition from both leftwing activists and politically motivated jurists who obstructed the administration. This June, the Supreme Court affirmed in Trump v. Hawaii that the president has clear authority to impose such bans. 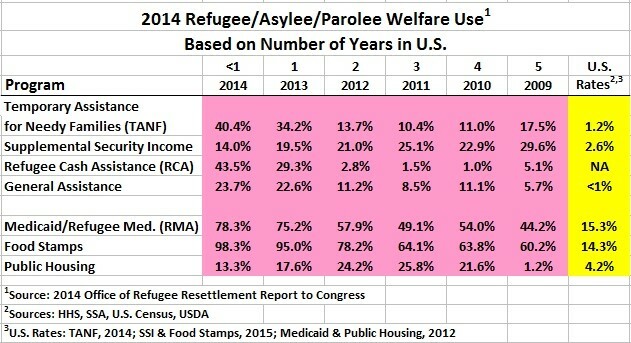 In the meantime, the least the government can do is assess the economic efficiency of the current resettlement program and consider the long-term effects of using politically motivated nonprofit organizations to administer billions of dollars of taxpayer funds.